When will be 99.9 next episode air date? Is 99.9 renewed or cancelled? Where to countdown 99.9 air dates? Is 99.9 worth watching? 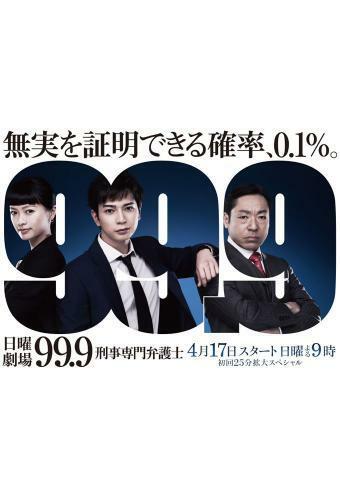 The conviction rate for criminal cases in Japan is 99.9%. However, this hides a big danger. Once indicted, there is a tendency to accept the prosecution's story at face value. There are also extremely few lawyers that specialise in criminal cases. Therefore, a thorough verification is very difficult. This is a drama about a team of expert criminal lawyers who pursues the truth that may be hiding in the remaining 0.1%. 99.9 next episode air date provides TVMaze for you. EpisoDate.com is your TV show guide to Countdown 99.9 Episode Air Dates and to stay in touch with 99.9 next episode Air Date and your others favorite TV Shows. Add the shows you like to a "Watchlist" and let the site take it from there.